Do cities need their own foreign policies? In a time of environmental crises, increasing inequity, and changing international aid landscapes, the private sector is needed now more than ever to achieve efforts in sustainable urbanization. And though collaboration between the private sector, civil society and government is challenging, especially within such pressing issues like climate change and rapid urbanization, cities are pushing forward, and delivering some successes. A shining example is a new umbrella initiative called City Partnerships that is being rolled out in Australia. It is a multi-partner approach that is aligned closely with the Implementation Facility for Sustainable Urban Development, a UN initiative that was ratified in Nairobi last month. City Partnerships aims to attract financing to projects that are high-impact, high-value, and will focus on bridging the gap between available global development funding and the much smaller amount of supplies and capabilities on the ground. As a coalition that sees great potential in public-private partnerships, IHC Global is enthusiastic about this new initiative, and hopes its success will lead to more cross-sector collaborations worldwide. cities need their own foreign policies? Last week, when President Trump announced that the U.S. was leaving the Paris Climate Agreement because he represented the "city of Pittsburgh, not Paris", Pittsburgh Mayor Bill Peduto responded quickly, declaring that the city of Pittsburgh would remain committed to the Agreement and making sure the citizens of the United States and the world knew that withdrawing from the Paris Climate agreement was not in the best interests of the city of Pittsburgh or the United States. He was not alone. Since the controversial decision to remove the U.S. from the Paris Climate Agreement, cities across America have joined together, along with big companies, with the intent to commit to the Agreement without the federal government. Since all of the signatories on the Agreement are states, this move is unprecedented, and an important moment for the rise in urban autonomy. In a world where urban areas now hold the majority of the global population, cities have proven to be movers and shakers on both the national and the global stage. For Politico, Ivo Daalder argues that as cities move farther away from the ideals and policies of their national governments, their similar interests -Mumbai and Miami have more in common than you think- are allowing them to look across continents to collaborate more than ever before. As centers for everything from equality to innovation, and leaders in the charge against everything from climate change to populism, cities have the capabilities and fluidity that national governments may lack to unite the world in common goals, and harnessing these powers may be the way to achieve a sustainable and bright future for all. IHC Global President and CEO Judith Hermanson is at the Chicago Forum on Global Cities this week. The forum addresses cities as central in international debates like climate change and security, and tackles the important issues that cities face, within their metropolitan areas and on the world stage. Members of city and state governments, civil society and the private sector were in attendance, including professor and author of The New Urban Crisis Richard Florida, mayors and former representatives from cities like Toronto, Amman, and Dublin, and members of organizations and companies such as UNICEF and United Airlines. IHC Global was pleased to see an emphasis on cities reaching across sectors and investing in public-private partnerships to create the best urban future possible. Read more about the forum here. Join an important discussion on the continuously shifting policy and legal landscape that LGBTQ people have to navigate to access and secure housing. Urban Institute will host a panel discussion, where they will present their findings from the first multisite, in-person, paired testing study on rental housing discrimination against lesbians, gay men, and transgender people. The panel will feature researchers and practitioners such as Urban Institute Senior Research Associate Diane K. Levy, National Center for Transgender Equality Policy Director Harper Jean Tobin, and many more, who will consider the next steps for the LGBTQ community in policy, research and advocacy. At the University of Buenos Aires last week, a report called Indigenous Latin America in the Twenty-First Century revealed a surprising statistic: half of the indigenous people in Latin America live in urban communities, and the population is only growing. The report focused on all of Latin America, but had some interesting information on its setting in Buenos Aires. With one million strong, the city has the highest concentration of indigenous people in Argentina, and it is the seventh largest indigenous population in South America. As much as a quarter of all indigenous people in Argentina make a living in and around Buenos Aires, and the rate of indigenous urbanization in the country is one of the highest in the region, at 82 percent. While living in urban areas is beneficial to indigenous populations in many ways, on average, one in three indigenous persons living in cities inhabit insecure, unsanitary and polluted slums, and their economic capabilities are difficult to integrate into urban societies. Indigenous communities migrating to urban areas makes sense for all of the reasons that urbanization is on the rise: cities tend to have better resources, education, health systems, social policies, and job markets. But even with all of these benefits, indigenous people in urban areas face culture and language loss, are relegated to unskilled positions, and don't have adequate political representation in government. It is commonplace to think that indigenous people live in the most rural areas of countries, and this perception is part of the problem: indigenous people are often invisible to most of urban societies, and their concerns are not adequately heard. Much like with any urban poor population, the exclusion that indigenous communities face has a negative impact on both the communities and the city as a whole. According to the report, it is not only necessary to provide these communities with the same resources and support that other communities enjoy, but to also provide them with dignity, a crucial missing piece that drives the strongest wedge in equality. Sustainable Development Goal 11, Indicator 4, calls for a 'strengthening of efforts to protect and safeguard the world's cultural and natural heritage.' In order to achieve SDG 11 and truly make cities that are inclusive, the voices, cultures, and identities of indigenous groups must be given a place in the city, and indigenous people must be given equal opportunity. Zagreb, Croatia, is home to one of the only LGBTQA pride parades in the Balkans. But can it survive the city's rising political corruption? An 81-year-old former teacher is leading the charge for recycling in Lebanon. Urban farms are cropping up everywhere, including Brooklyn. Cities struggling to eradicate poverty have found a nemesis in legacy infrastructure. 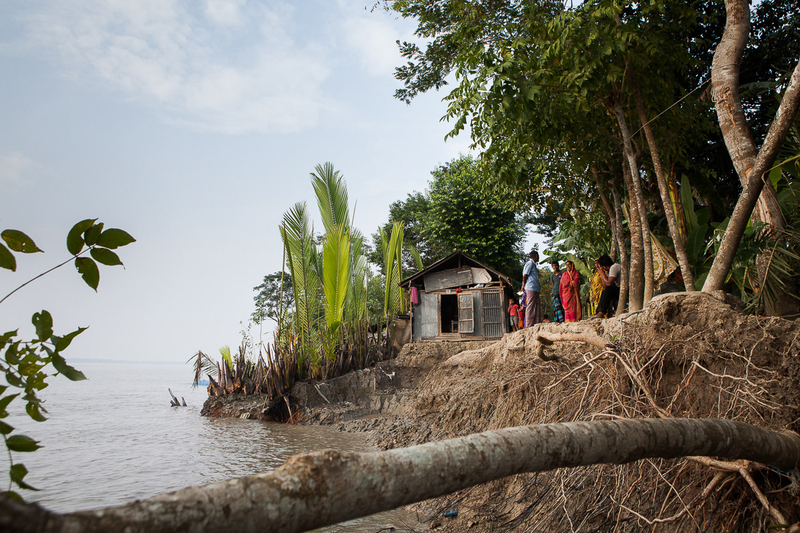 As the world feels the impact of climate change, Bangladesh is one of the countries that has been hit the hardest. In the village of Kanainagar, river erosion has destroyed the main road and houses that once stood at its shore.